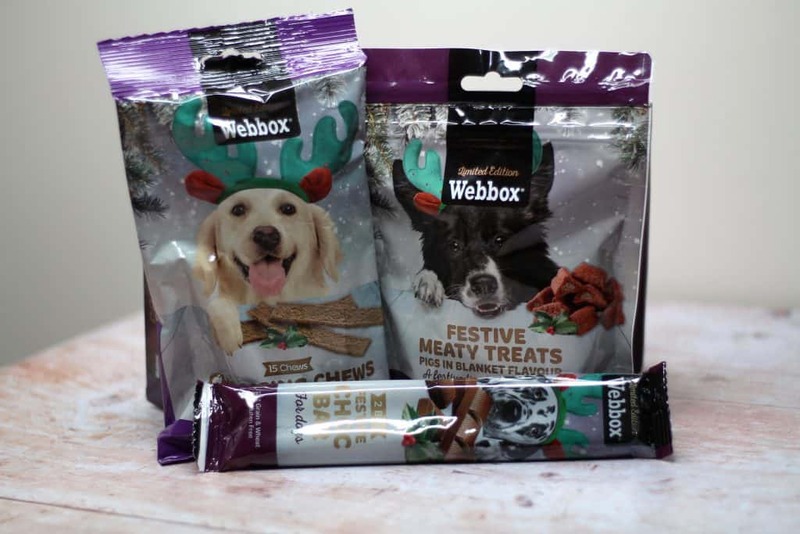 My dogs previously tested out the Webbox Natural Dog Treat range which of course went down a .. treat! So, when we were sent the Webbox Festive Range I had two very excited dogs! 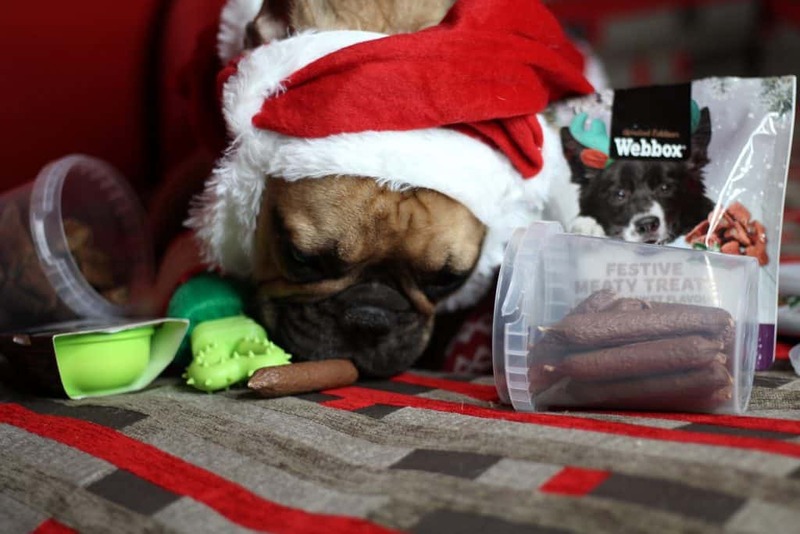 We received three Webbox festive dog toys which went down a storm. The first was a Gingerbread Man which is soft yet tough with a squeaker in the middle. Stitch’s favourite which if you watched my unboxing on Instagram you will remember was the elf rubber toy! 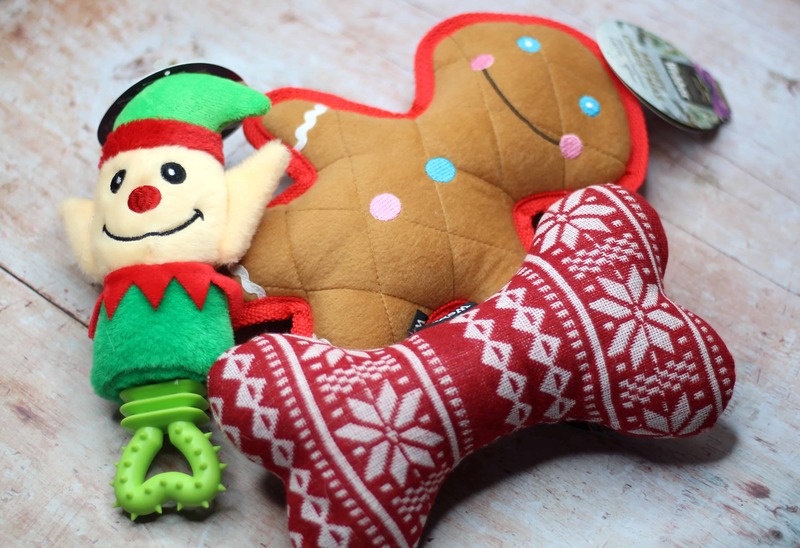 The third is a festive bone shape similar to the gingerbread man with the squeaker. All three toys are successfully festive and still very practical as dog toys. My dogs can be quite destructive and have been known to destroy a dog toy within a matter of minutes to get the squeaker out. I have to say though all three toys were highly durable and made very well. They have been playing with all three consistently for a few weeks now and they are still standing. All be it a bit more battered than when they started but as far as longevity goes I am quite impressed. Little Stitch, my French Bulldog took a bit of a shining to the elf rubber toy. In fact he was a little obsessed and has become very fond carrying him around most of the time. I think this is to do with the size being perfect for him and it being different to the standard squeaky toys. Overall all three toys are well made and are being thoroughly enjoyed by both dogs! These are grain free and made with fresh pork which as a dog owner is good news. The treats are a good size and a nice soft texture. These will be perfect for taking out on dog walks or as a treat at home. Both dogs seem to have taken a liking to them and find them easy to eat. These are wheat gluten free and made with fresh turkey. These are long soft strips which Roly our Olde English Bulldog devoured in seconds but Stitch savoured! Out of all the treats this was one of Stitch’s favourites. They were easy to eat and a nice size. This bar is 100% safe for dogs unlike real chocolate! It’s easy to break into smaller pieces which would make it ideal to use with a ‘fill your own’ advent calendar. The Choc Bar is grain and wheat gluten free. Both dogs liked the chocolate and found it easy to eat. Stitch took his time over it which made it a good choice when I wanted to keep him busy! 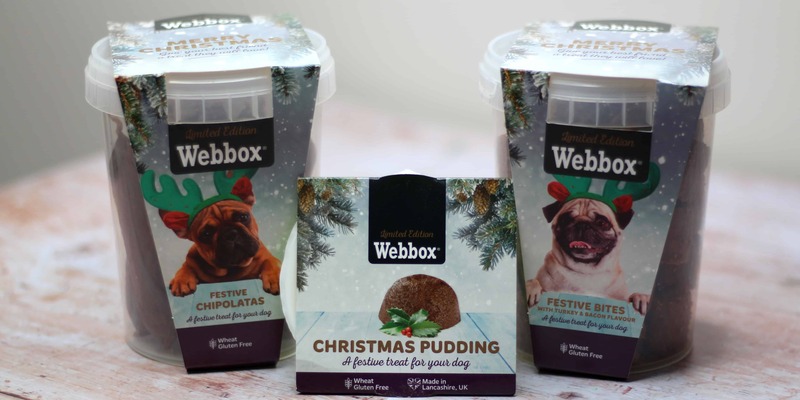 Actual Christmas pudding is poisonous to dogs so if you still want to give your pets a treat the Webbox Festive range has a Christmas pudding that is completely safe for dogs. Both dogs seemed to like it and it was easy to eat. For smaller dogs like Stitch it is recommended that they only have half but both dogs shared it and were more than happy with that. 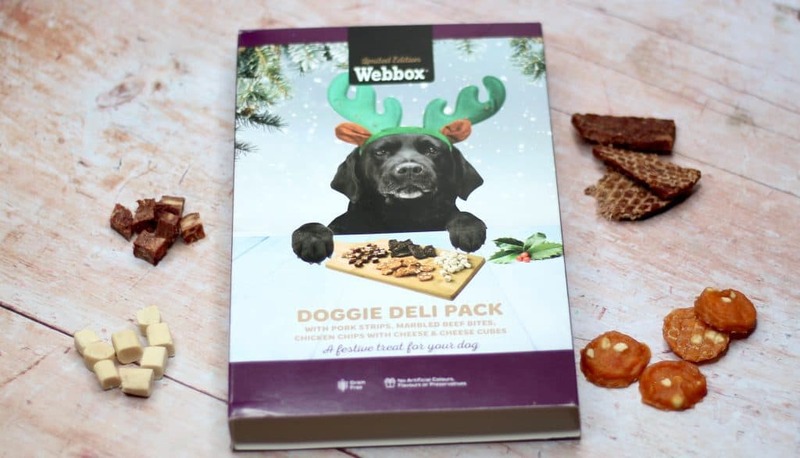 The Webbox Festive Christmas pudding is wheat gluten free and makes a cute festive complementary food to spoil your dog with this Christmas. Wheat gluten free sausage shaped treats that come in their own plastic container. These are a firmer treat that took a little longer for each of them to finish which was nice! I liked the container they came in because it’s often difficult storing loose dog treats but the plastic container was the perfect size. I think out of all the treats these were my favourite because they lasted a longer time. Another wheat gluten free soft treat but these come in their own plastic container. Again these are a wonderful size which make a great treat for rewards throughout the day or when on walks. Both dogs really enjoyed them and found them easy to eat! This is a great idea to hang on your Christmas tree if you have a dog at home. I’m not entirely convinced our tree would last around our dogs with this hanging on it! Both dogs were obsessed when I got it out of the box and I can imagine them trying to get it down from the tree! The milk bones are a lovely treat though and if you have well behaved dogs then I don’t see why you couldn’t hang it on the tree! A festive selection of pork strips, marbled beef bites, chicken chips with cheese and cheese bites! Everything in this selection is bitesize and a lovely selection which my dogs really took well too. They are the perfect size for training or taking on walks and much better for your dog than feeding chunks of cheese which I have been guilty of doing in the past. 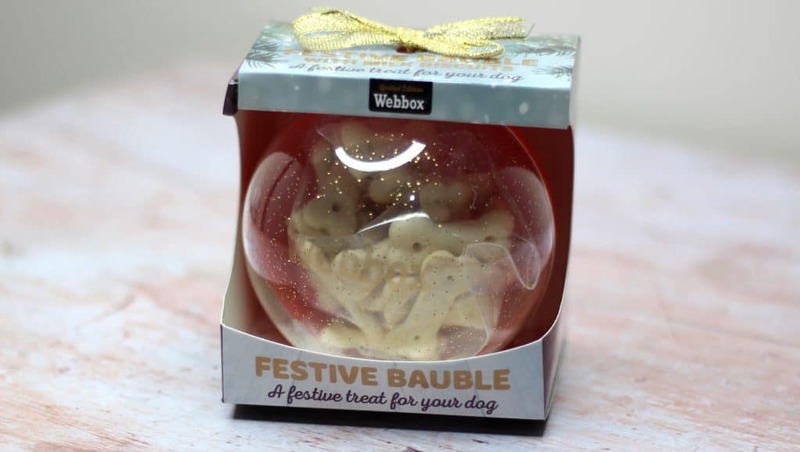 All the Webbox Festive range are made in Lancashire UK which is refreshing. I have heard many horror stories regarding dog treats being made abroad and often contain ingredients that are less than favourable for our four legged friends. I think everything is made really well with the consumer (the dogs) in mind. The treats are easy to eat and a good size which makes it easier to portion control and not over feed them. I think the toys themselves are really well made and both dogs enjoyed playing with them. There wasn’t anything I didn’t like about the range and I would definitely purchase them again! 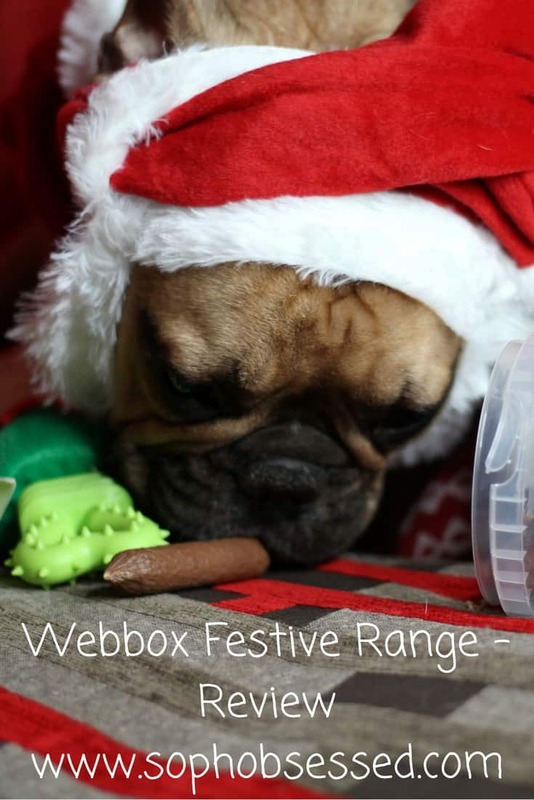 For more information on the Webbox Festive range head over to their website here. I received the Webbox Festive Range on a gifting basis in return for an honest review however as always all words, opinions and thoughts are my own! For more information on any of this please visit this page.